The situation in Sweden in 1520 was chaotic. The point of contention was Swedish sovereignty. The pro-union faction that championed allegiance to King Christian II of Denmark was headed by Archbishop Gustavus Trolle. The supporters of Swedish independence were led by Sweden’s Regent Sten Sture the Younger. King Christian II had already stepped in to assist Archbishop Trolle, who was under siege in his fortress. Sten Sture and his army defeated the King’s troops and forced him to make an undignified retreat to Denmark. Christian tried once again to get Sweden under his control in 1518 but was bested by Sture yet again. But the third time proved to be a charm for the King when Sten Sture was killed on January 19, 1520 at the Battle of Bogesund. While many surrendered at this point, Sture’s widow, Lady Kristina Gyllenstierna, had not yet begun to fight. She rallied the remaining resistance to her, determined that Sweden would remain independent. The war raged on for many months, culminating in the Danish fleet arriving in May and Stockholm being attacked by both land and sea. Nevertheless, Lady Kristina kept up the fight until September when she finally surrendered on the condition that a full amnesty would be granted to all members of the resistance. Christian II played himself off as the very personification of the merciful monarch in this, granting this request in writing. But he had no intention of letting bygones be bygones. 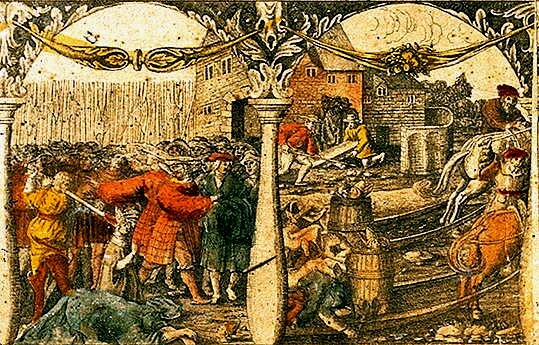 After he was officially crowned king of Sweden, he almost immediately instigated what is known as the Stockholm Bloodbath, which occurred over November 7-9, 1520. During the coronation festivities, the King invited members of the nobility to a special meeting where the newly reinstated Archbishop Trolle announce that most of the noblemen present were guilty of heresy since they had attempted to depose an archbishop from his archbishopric (Trolle, of course) a few years earlier. Kristina immediately cried foul, and produced the document proving that Christian had promised full amnesty. But the King noted that while he could, and did, grant amnesty for the offenses against himself, the crime in question was a Church matter- something he had no authority over. The accused nobles, for their supposed crime of heresy, were ultimately brought out to Stockholm’s main square and either beheaded or drowned. Over 80 men were executed during the Stockholm bloodbath, and it was no coincidence that they were supporters of Sten Sture the Younger and his widow Lady Kristina. On top of that, the King ordered the body of Sture and his toddler son dug up and burnt as heretics as well. Kristina was reportedly given the choice of death by burning at the stake or being buried alive. However, before the deed could be performed, the king’s advisers recommended against such a course of action. Instead, she was exiled to Copenhagen. The exile didn’t last long. The bloodbath didn’t go over well with the locals (shocker) and a new revolt began under Gustav Vasa, the future king of Sweden (from 1523 to 1560) and the son of one of those who’d been massacred, Erik Johansson Vasa. This revolt ultimately resulted in Christian II being ousted from Sweden (and indeed his whole kingdom, being replaced in Denmark by his uncle, Duke Frederick of Holstein) in 1523 and soon saw Sweden and Denmark permanently separated.